Nectar Pillow Review : Can This Pillow Prevent Neck Pain? Home » Nectar Pillow Review – Can This Pillow Prevent Neck Pain? Nectar Pillow Review – Can This Pillow Prevent Neck Pain? There’s no use investing in a brand-new mattress if you’re going to keep using your old, bad pillow. Just like you have to find the right mattress for your body type and sleep position, your pillow is an important part of your sleep equation. A high quality pillow that should appeal to hot sleepers as well as those who want contouring support for their neck. You get 2 pillows for free if you buy their mattress as well - great deal. A pillow that is too high is going to compromise spinal alignment, by putting your head too high above your shoulders or at an angle. Conversely, a pillow that is too soft is going to angle your head down towards your mattress and put pressure on your neck. Either way, you’re going to be tossing and turning and you aren’t going to get a good sleep if you don’t have the right pillow.In fact, many sleep problems besides sleeplessness can be attributed to the wrong pillow, including snoring, neck and back pain and even recurrent headaches. People who sleep hot can also have problems sleeping if they have a pillow they are always flipping to get to the cool side. The Nectar mattress company saw a need for a better pillow that matches the quality and adaptive feel of their mattress and so they designed their own pillow, available for purchase either with or separate from the Nectar mattress. We’ve looked inside the construction and materials of the Nectar pillow, so you can decide for yourself if it’s worth the splurge. You are in the market for a new, high quality pillow: Most pillows are just one piece of foam, shredded poly foam or feather filled. The Nectar company offers high quality foams and a customizable feel. If you are looking for a new pillow with some extras, the Nectar might be a good pillow for you. You sleep hot: The Nectar pillow offers several technologies to keep their customers cool. From a quilted memory foam outer shell and breathable cooling foams inside to a moisture-wicking Tencel cover, the Nectar pillow is a good choice for hot sleepers who want a memory foam pillow. You don’t mind splurging on good construction and materials: The Nectar pillow is not as cheap as some department store pillows, but it’s not as expensive as some high-end pillows. For a fully customizable pillow that is designed to be perfect for you, $75 is not that much to pay for a good sleep. It’s adaptive and responsive foams mean that it’s going to have good bounce back for many years to come and won’t sag and get flat like an old foam pillow. You like the idea of customizable firmness level: An idea so simple, it’s strange this isn’t the norm in pillow construction, the Nectar pillow means that everyone can get the pillow they want. If you like the idea of designing the perfect pillow for you, you might want to check out the Nectar pillow. What makes the Nectar pillow interesting is that they make just one type of pillow but it is made in such a way that each customer can individually customize it to their preference. To do this, they provide a pillow with two individual shells, or what they call a “pillow-in-pillow” design. 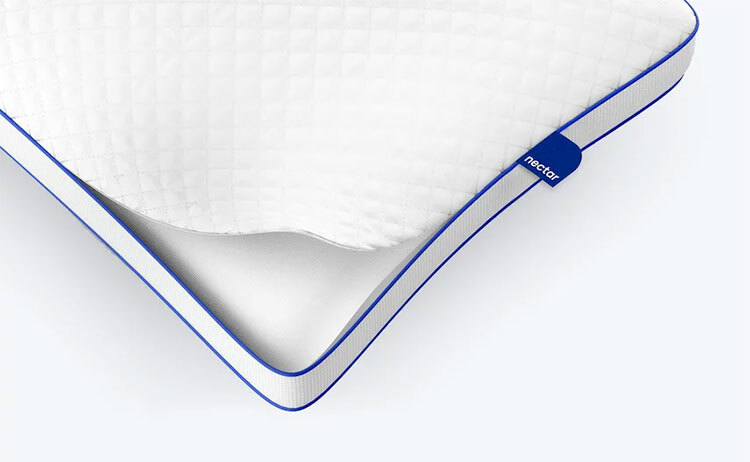 The inner shell of the pillow is filled with three types of shredded, premium foams: visco-elastic memory foam for contour and comfort, Dunlop latex for good rebound and responsiveness and Up Foam, which is designed to keep your spine aligned. These foams are held within this shell with a zipper enclosure, with the idea that you can you take out as much foam as you need in order to get the perfect level of support and structure for you. This is great for people who want the feel of a memory foam pillow but usually find them too high or firm. You can store the extra, leftover foam and add or take away more as needed, throughout the pillow’s life. What you’re left with is a responsive, cool and supportive pillow, that is basically custom made. The pieces of foam are small enough that you don’t feel their individual corners while you are sleeping but large enough that they each work to provide some support and loft to the overall feel of the pillow. This inner shell sits inside the outer shell of the pillow, which is with another layer of quilted memory foam, to give a cradling, floating feel to your head and to smooth out the surface of the pillow. These two layers are wrapped in a Tencel fabric cover, so it always stays cool and dry. Because the Nectar pillow is designed to be fully customizable and adaptive, it is meant to be supportive and perfect for all sleep positions and body types. Just add the right amount of foam to make it work for you. Give it a try for a few nights and you can always add more foam down the road if your preferences change. Customers who sleep on their back are giving this pillow good feedback, because some normally find memory foam pillows too high or stiff and side sleepers who prefer thinner pillows are also happy. The positive feedback for all types of sleepers is no doubt related to the fact that all customers can get the exact pillow they want by just removing or adding foam. The Nectar pillow is sure to be quite cool for hot sleepers, just like the company’s mattress. As previously mentioned, the cover of the pillow is made from Tencel fabric, so it’s naturally moisture wicking and breathable. The spaces between the foam chunks in the inner shell allows air to circulate and the inner shell also contains latex foam, which is naturally cooling. 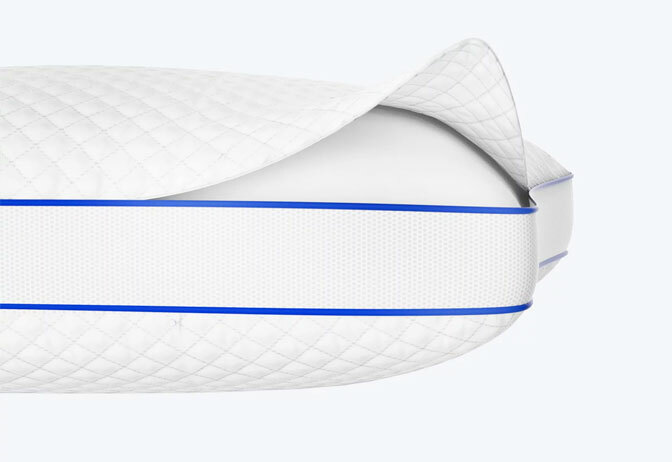 While there is memory foam in the outer shell, it is quilted, which further promotes air circulation and because of the pillows inner structure, your head won’t sink in too much, depending on how much foam you’ve removed. The whole package makes for a cool pillow, which Nectar claims will always have you “sleeping on the cool side”. 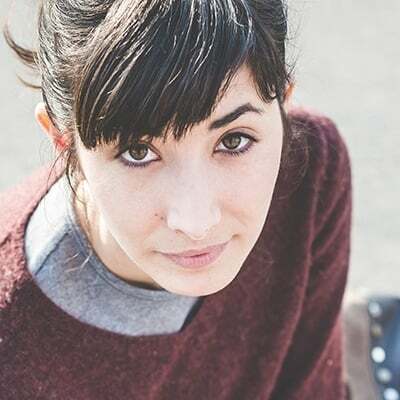 It was admittedly a bit difficult to find information on Nectar’s website regarding sleep trial and warranty for their pillow, as so much space seems to go towards promoting their mattress and its great sleep trial period and warranty. We reached out to the company directly to get the low down and we were impressed. Although there is no sleep trial period for the pillow, the company offers a 90-day refund policy on unopened product and a 30-day refund if the pillow has been opened. While this doesn’t really compare with the policy on their mattress, it does give you enough time to try out the pillow and make sure there are no defects. And, since the pillow is fully customizable, a sleep trial period isn’t really necessary like it is with a mattress. The Nectar pillow is fully surface washable. The company recommends that if you need to wash your pillow, just wash the exterior with soap and water, pat gently, squeeze out the water and let it dry naturally, without a washer or dryer. More and more online mattress companies are branching out into accessories and so there will likely soon be more pillows on the market. It makes sense if you are going to invest in a new mattress for your body, you don’t forget your head! The Nectar pillow is a refreshingly simple solution if you want to buy a new pillow online but want to make sure it feels right. 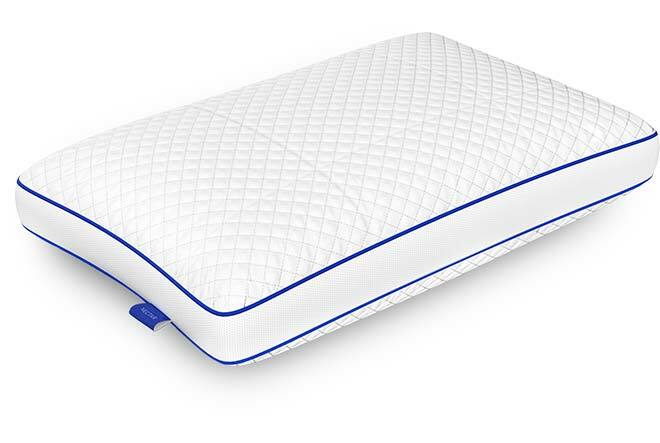 PrevPreviousDreamCloud Mattress Review 2019 – Can The DreamCloud Bed Hold It’s Promise?